The Poldark DVD box set includes all 4 series starring Aidan Turner. The year is 1783 and the disastrous American War of Independence has ended. Ross Poldark, a soldier, returns home to Cornwall, to Nampara, his house and land, and to two idle mines, all fallen to disrepair. He hopes to settle down with his inheritance and his beloved Elizabeth, but false reports of his death precede his arrival, resulting in heartbreaking circumstances. Based on the novels by Winston Graham, the series develops into one of romance, fierce rivalry, smuggling and adventure. Returning home following his arrest in the finale of series one, Ross soon faces a new fight for freedom when George Warleggan tries desperately to steal his mine and have him hanged as a revolutionary. Crippled by debts, Ross and Francis strive to heal old wounds by joining forces in a new venture, while buried passions threaten to bubble to the surface once again. Amid catastrophic losses, significant triumphs and shattered relationships, they must learn to settle their differences once and for all, but at what cost? 1794: War and the revolution in France hang over Britain. In Cornwall, George Warleggan grows his empire with a view to crush the Poldarks while Ross and Demelza attempt to keep the peace and repair their relationship at Nampara. However, the arrival of Demelza’s brothers disturbs the fragile truce and Ross must ask himself how long he can allow George’s ascent to continue unchecked. Facing battles both at home and abroad, will Ross answer the call and risk losing everything he holds dear? With fans still reeling from the climactic events of series three, the fourth series of the world’s much loved drama Poldark returns for 2018. Ross must defend Cornwall from an empowered George Warleggan, and risks everything he holds dear as he embarks on a political journey which takes him to the nation's capital. Demelza finds her loyalties torn, Elizabeth tries to strengthen her marriage, Morwenna continues to be oppressed by husband Reverend Ossie Whitworth and the Enyses are tested as never before. 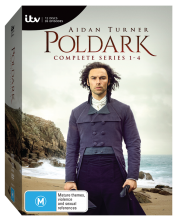 Click the button below to add the Poldark - Season 1-4 to your wish list.